Im Nachgang zweier Kongresse, die Ende September und Anfang Oktober in Bremen stattfanden, haben wir einen Blog-Beitrag/Bericht verfasst, der unsere Erfahrungen vor Ort wiedergibt. Der Beitrag wurde auf Englisch verfasst und wird vorerst nicht übersetzt. 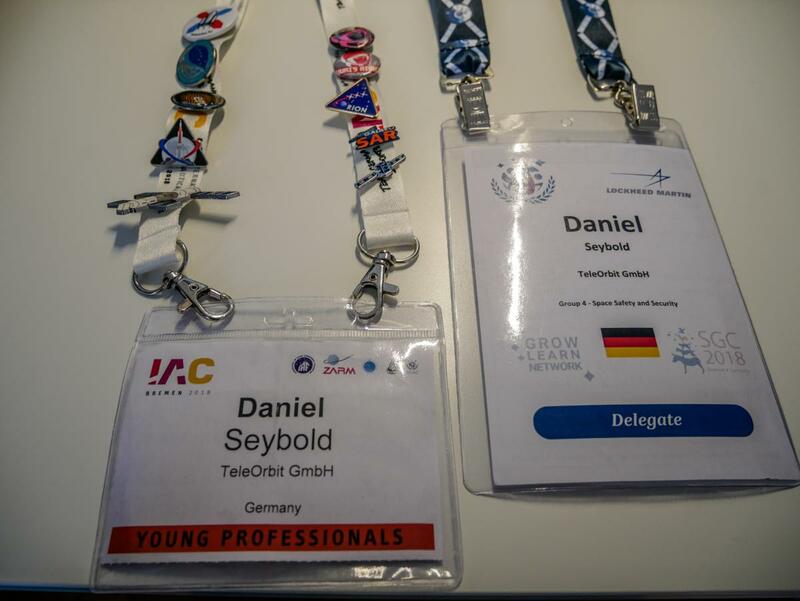 From October 1 until October 5, our company, represented by Jürgen and Daniel Seybold, attended the International Astronautical Congress IAC in Bremen. We were part of a Bavarian “delegation” lead by bavAIRia e.V. our Bavarian aerospace cluster and shared a big booth with other members of bavAIRia. We presented our GNSS high-tech products, which we are selling on behalf of our partners Fraunhofer IIS and TeleConsult Austria. We could even display one of the recent additions to our portfolio, our multi-GNSS receiver with an open software interface named GOOSE©. The IAC is a big conference with an exhibition and focuses on all things space, covering topics as diverse as space law, “colonizing” Moon and Mars, propulsion, and even space history and psychology. Over the five days delegates could listen to almost 2200 presentations in 180 sessions. This was a new record number. The number of delegates also reached new records seeing around 6500 people attending the IAC 2018 in Bremen. And to top all those numbers, there is one additional number that is both mind-blowing and super exciting! On Wednesday, October 3, national holiday in Germany, IAC opened its doors to the public, giving space enthusiasts the chance to wander around the exhibition hall and to experience this atmosphere themselves. During the public day we saw a live-call to the Space Station with German ESA astronaut Alexander Gerst as well as a second live-call in which he got handed the “key” to the ISS and became the first German ISS commander! These live-calls as well as additional panels featuring astronauts and space agency heads happened in the nearby ÖVB Arena. The arena was buzzing and almost no seats were left empty. The organisers announced that, in addition to the 6500 delegates, around 13000 visitors came for public day. Another record! For us, this day was super hectic as you can imagine, but we are also very impressed with how well the day was organised. In terms of business, we had many meetings, discussions at our booth and interesting interactions at other booths and during the evening and side events. Since it was our first IAC, we didn’t really know what to expect and can report that we are super happy with the outcomes of the congress. Our GNSS business is a very niche market within the space industry but we met many professionals who are active in other space segments and who have specific needs we can meet. The future will tell, if the IAC was a (business) success. For now, we want to thank the organising “Team Germany” for all their hard work over the last two years which made the congress so successful and enjoyable! We would also like to thank bavAIRia e.V., namely Bärbel Deisting, Sabine Kling and Anne Schnitter, for their support before and during IAC! Just before IAC, I (Daniel) attended the Space Generation Congress SGC organised by SGAC, the Space Generation Advisory Council. The Space Generation Advisory Council in Support of the United Nations Programme on Space Applications is a global non-governmental, non-profit (US 501(c)3) organisation and network which aims to represent university students and young space professionals ages 18-35 to the United Nations, space agencies, industry, and academia. Headquartered in Vienna, Austria, the SGAC network of members, volunteers and alumni has grown to more than 13 000 members representing more than 150 countries. SGC is the biggest event organised by SGAC and is linked with the IAC. It always takes place in the same city as the IAC and happens just before IAC. This year, it took place from September 27 until September 29. It is organised in a similar manner as many other SGAC events, consisting of plenary sessions with invited high-level speakers and working groups addressing different topics. For this SGC in Bremen, topics ranged from insights into the recent activities at Blue Origin, updates on the development of the ORION module or the Lunar Gateway, and many more. The working groups (seven in total) focused on topics as diverse as space exploration and commercialization to space policy and space society. The SGC was “accompanied” by evening events as well. Traditionally, these are the international cultural night, the space night and the gala dinner. During the international cultural night, delegates from each country present their home country by performing a dance, singing a “traditional” song or doing a quiz. And everyone is encouraged to bring some local delicacies to the event as well. This is one of the best and most fun (side) events you can think of! The gala dinner marks the formal ending of SGC. This year we were hosted by the president of the senate of the free hanseatic city of Bremen, mayor Dr. Carsten Sieling. For the dinner we were invited to the city hall Bremen, a truly stunning venue with lots of history! The gala dinner itself saw guest from all kinds of backgrounds, most SGC delegates, business leaders, space agency heads like Jan Wörner, Pascale Ehrenfreund, or Jean-Yves Le Gall, as well as “celebrities” like Bill “The Science Guy” Nye. I have to thank the organising team for all their work! Remember, SGAC involvement is voluntary and everyone invested a lot of free time to pull this off! Overall, both events were simply great, offering me personally, but also our company many opportunities! It was so much fun spending these days in Bremen with existing and new friends and to experience ten days of space in full speed! I, and potentially our company as well, will make sure to be back for many more SGCs and IACs! These events and the people involved perfectly show why space is THE industry to be involved in! Schnittstelle eines internen Netzes zu anderen Netzen (Internet), oder zwischen Internet-Netzen wie Vodafone und T-Online, um die unterschiedlichen, teils proprietären Protokolle zu übersetzen.